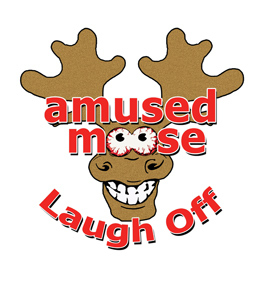 The prestigious Amused Moose Laugh Off contest, which searches out the next big comedy stars from new talent across the UK, is about to kick off with online entries opening at 1pm on Saturday 7th March 2015. This exciting countrywide talent search for comedy’s brand new comic gems is famed for discovering the comedy stars of the future such as previous winners Sarah Millican, Jack Whitehall and, more recently, Rob Beckett. In an Amused Moose first, entrants will be viewed and scored online by our illustrious comedy industry panellists around the world. Entries, in the form of a 90-second performance clip filmed in a comedy venue, must be submitted online by the end of March 2015. This innovative process ensures that the Laugh Off entrants will all be seen by a substantial number of comedy industry professionals including agents, managers, promoters, bookers, producers, critics and PRs in Australia, Canada and the USA as well as here in the UK – making this competition an even more effective way for new comedy talent to get spotted and get their career off to a flying start! Live quarter and semi- finals will be held in London throughout May and June with the final, featuring a celebrity host, taking place on 9th August as part of the Edinburgh Festival Fringe. Audience votes, as well as those of our industry panel, will be taken into account during all live rounds of the competition. Amused Moose Comedy Awards have proved to be a fantastic shop window for new talent, with finalists being quickly signed by leading agents and promoters including PBJ Management, Chambers Management, Avalon and Off the Kerb. As well as being given the perfect platform from which to launch their comedy career, all finalists will receive a portfolio of professional photographs. The winner of the Amused Moose Laugh Off title will also receive a shiny moose trophy, interim management and PR (if required) and have the opportunity to perform as part of Amused Moose Comedy Showcases at London’s Soho Theatre this Autumn.